The World of Shakespeare at Your Fingertips! Once you’ve finished staging the Bard’s entire canon, you can mix and match masterpuppets to produce your own Shakespearean mash-ups. Perhaps your Romeo will fall in love with Lady Macbeth! MIKE ROGALSKI owns and operates EYEWASH, a graphics studio in the Philadelphia suburbs. This is his first collaboration with William Shakespeare. I love the idea of this set. As far as teaching, or learning Shakespeare, performing it is really how to best understand it. So for teaching Shakespeare, it's excellent. Also, the verbiage is authentic Shakespeare,which often times is not the case in sets or books to teach children. To me Shakespeare is Shakespeare and to change it makes it not Shakespeare. The finger puppets are awesome & include all the characters you associate with Shakespeare. The graphics are wonderful and it's cool to see these characters come to life. The only part of this set that I'm not thrilled with, is that the stories are a little too condensed for me. The plays are not complete. But it's not a huge deal, if we want to act out all of the scenes, I can provide what's missing from a book, or online source. Over all I think this is a fun set & great learning tool. Yes Shakespeare can be fun! 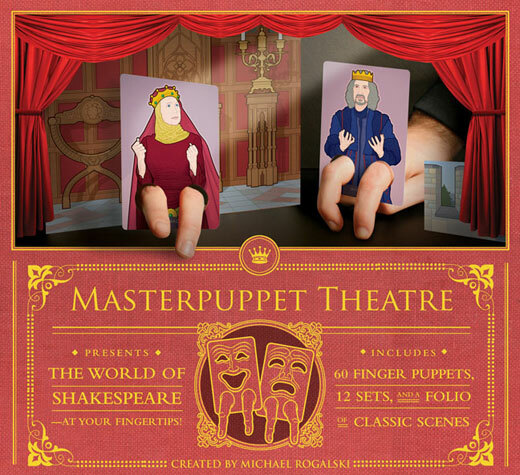 One lucky winner will receive the Masterpuppet Theatre: Shakespearean Fingerpuppets set ! 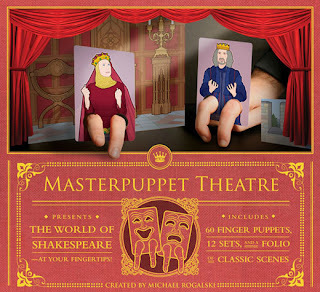 *Follow me @jamaise at Twitter & Tweet this : RT @jamaise #GIVEAWAY #WIN - Quirk Books ~Masterpuppet Theatre: Shakespearean Fingerpuppets ~ http://bit.ly/a85OVY Ends 11/06 #homeschool tweet each day for one entry each ! I follow your blog and I'd like The Spotter's Guide to the Male Species by Juliette Wills. Thanks. I would be interested in the Secret Lives of Great Authors! I like Qirkbooks on Facebook. I entered the Wanchai Giveaway! I follow through google friend connect. I would also like the book Pops! I would love the Pride and Prejudice and Zombies Poster! I entered your AZO giveaway!